"We guarantee there will be at least one woman in the Fan Cave this year," says MLB chief marketing officer Jacqueline Parkes. The MLB Fan Cave concept is simple: put baseball fans in a fully loaded, tricked-out apartment in New York City where they will watch 2,400-plus regular-season games and playoff contests and register their reactions in real time on social media. It all sounds like fun, but Major League Baseball took some heat during the Fan Cave's inaugural season in 2011. For this season's iteration, MLB has made some changes. Fans will still live and breathe the game they love, but MLB has implemented a more transparent application and audition process to narrow down the more than 22,000 applicants. And there are women involved. On Feb. 8, MLB announced the top 50 candidates and posted their videos online at MLBFanCave.com. Fans voted for their favorites, narrowing the list to 30. The league then surprised the top 30 with a two-day, all-expenses-paid trip to spring training last week in Arizona, where contestants were put through a series of challenges and adventures, including player interviews, trivia games and meetings with MLB executives. At least six finalists will be selected for the Fan Cave. Once they all arrive in New York City, fans will vote candidates out, "Survivor" style. After the final champagne cork pops in October, the winner may even land a baseball dream job like Wagner, an Orioles fan who became the new public-address announcer at Oriole Park at Camden Yards. Nine of the 30 finalists are women; while it's not quite representative of the 46 percent fan base, it's a great start. Andy Bishop, Taylor Hensley, Ashley Chavez and Amie Matthews were a few of the 30 contestants who took part in tryouts last week at spring training in Arizona. "We wanted the Fan Cave to represent the fan base as much as anybody else did, and hopefully this year we're going to be able to deliver on that," MLB chief marketing officer Jacqueline Parkes said. "Women are a huge part of our fan base. 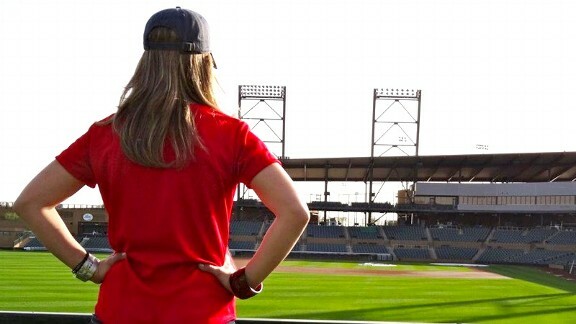 We're the largest percentage of women of any professional league ... we know that females have a huge role in the workplace and in the household and in the lives of Major League Baseball fans. Obviously, as any good marketer, we want to ensure that people who are the voice of the fan represent the fans to the extent possible. "We guarantee there will be at least one woman in the Fan Cave this year." The importance of having a female point of view isn't lost on this year's finalists. "It is extremely important because I think women sometimes have a different take on things," Megan Washington, one of the finalists, said. "We are all knowledgeable in the game of baseball, we are all die-hard fans of our teams and I think some of us are actually giving the guys a run for their money. I think it is really important that they showcase a woman's point of view and not just the man's point of view. It's the Fan Cave not the Man Cave." This year's female finalists represent the A's, Cardinals, Diamondbacks, Giants, Indians, Rays, Red Sox and Twins. Several of the women, including Melanie Pellowski, Ally Williams and Lindsay Guentzel, have broadcasting and writing experience and hope to further their career goals. "The Fan Cave is a dream job. It combines everything I love," said 25-year-old Guentzel, who is a freelance sports reporter and on-air personality in the Minneapolis area. "It combines baseball, social media, journalism, entertainment and it is in New York City. Had I not even made the top 30, just getting here was a great learning experience and one that will definitely help in any upcoming endeavors. I have to do something that involves baseball." Others, like Washington, Ashley Chavez, Taylor Hensley, Amie Matthews, Christy McGaugh and Kelsey Shea Weinrich, simply couldn't resist an opportunity to turn their passion for baseball into a dream job, despite having no previous experience. McGaugh worked three springs as an intern with the Giants and worked for the Arizona Fall League and Diamondbacks but is currently a freelance writer in her native Phoenix. She has a biting sense of humor and sharp eye -- her audition video involved re-enacting scenes from popular films such as "Moneyball" and "American Beauty" with a baseball twist (instead of rose petals in the bathtub in "American Beauty," McGaugh used baseball cards). McGaugh would not share her age ("a lady never tells," she said), but she is the oldest of the group. Reports out of Phoenix confirmed she more than held her own among the younger contestants during Fan Cave challenges (and late-night karaoke). And don't get the Arizona State graduate started on pink jerseys and hats. 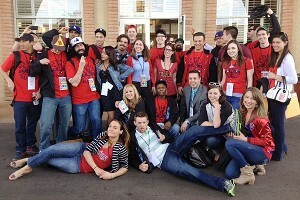 The contestant group will be narrowed down to at least six finalists who will be part of the Fan Cave in New York City. "I hate them. I have a violent reaction to them," McGaugh said. "I think it's really condescending. I just want to tear them off their backs when I see them. ... If you're there and you like the team, you want to look like the team. The only jerseys that are cut in your size aren't even the color of the team. I hate it. I don't understand the pink." But the Diamondbacks fan's flexible schedule allows her to indulge her baseball addiction. "I have three TVs and I have the MLB package," McGaugh said. "At 4 p.m. every day, which is 7 p.m. Eastern, I turn on each TV and a different game on each channel. It's always on in my house. One way or another, I'm pretty much doing the same thing anyway, so it would be pretty cool to do it in New York." Washington, 26, has "about 500 different jobs," including working promotional events in the Tampa area and managing professional wrestlers. Washington loved wrestling growing up (especially Randy "Macho Man" Savage and Hulk Hogan) and started training in 2004 to become a professional wrestler, but she was diagnosed with a heart condition two years later. Though she had a corrective procedure, she decided she couldn't go back into the ring and went into managing wrestlers instead. Though she grew up a Yankees fan, along with her dad, Washington adopted the Rays when she attended college at the University of South Florida. As the Rays' representative, she said she will "bring the 'extra 2 percent' to the Fan Cave." The music lover heard about the Fan Cave last season and couldn't wait to apply. "Since I have the family history of always enjoying the game and bonding with my family over the game, I just thought that it would be a fantastic opportunity," Washington said. "Because who wouldn't want to sit in the Fan Cave watching all those games every day getting to meet and interview your favorite player that you just watched on TV all the time and make skits with them and blog and do all kinds of crazy stuff? That really sounds like the best job in the entire world." No matter how many of these women are selected for the Fan Cave, all agreed the past month has been unforgettable. "My life has completely changed from what it was a few weeks ago. Not even just the stuff that MLB has been having us do and the career moves, but I have these friends now, these lifelong friends, and I know we're all going to stick together," Weinrich said. "No matter who makes it or who doesn't make it, we're all still going to be talking baseball all the time and we found this little family and this community. It's definitely one of the most life-changing experiences I've ever been through."